Pre-Toasting: Many recipes and saffron fans will tell you that you should lightly toast saffron threads on the stove to dry them out completely, enhancing their flavor. Whether or not this is a good idea actually depends on how thoroughly the saffron you have was dried. The producers of our Persian saffron threads do not recommend toasting, because it’s already extremely well dried (and would scorch), whereas the makers of our Spanish saffron threads do. To toast saffron, simply briefly heat the threads in a dry skillet on the stove over medium high heat. Keep them moving, and keep a very close eye on them, you don’t want them to scorch. Pre-Steeping: In general, saffron threads should be steeped in a hot, acidic, or alcoholic liquid for at least 20 minutes prior to being added to your dish. Once steeped, both the threads and the liquid are added to the dish. Converting Saffron Powder Recipes to Threads: A good rule is to use roughly 20 threads for each pinch (~1/16th tsp) of powder called for. However, high quality threads are more potent, so you may not need as much. Remember to add a pre-steeping step to the recipe (perhaps in 1-2tsp of hot water) if it doesn’t already include one. Alternatively, you can crush saffron threads into your own powder (toast the saffron first if you normally would when using whole) and follow the original recipe measurements. Saffron powder can usually be added to recipes without any prior preparation. Converting Saffron Thread Recipes to Powder: substitute one pinch of powder (~1/16th tsp) for every 20 threads called for. Many saffron powders are less potent than saffron threads (they’re often made with less pure saffron), so you may have to use more. 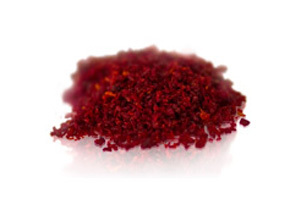 Our powdered Iranian saffron is made with the same threads we sell whole, so they’re the same strength by weight. What Flavors Work Well With Saffron? Saffron can be used in stews, risottos, puddings, ice creams, baked goods, soups, seafood dishes, sauces, and rice dishes (basmati, paella, or risotto). Saffron pairs well with flavors such as apples, almonds, cardamom, honey, poultry (particularly heritage chickens and squab), bone marrow, milk or cream (try it in ice cream! ), cinnamon, lamb, seafood, garlic, white wine, vinegar, rose water, and citrus fruits. Fresh herbs frequently paired with saffron include: basil, cilantro, rosemary and thyme. 1. Saffron’s released pigment is so potent it stains (at least temporarily) very easily. Avoid using wooden or porous plastic utensils or containers. 2. Saffron will continue to release flavor into the steeping liquid for up to twelve hours (at a slower and slower rate) if you let it, so if you don’t mind waiting you can get even more bang for your saffron buck.